Did you know that Bodmin has more visitor attractions than any other town in Cornwall? And better still, every single one of them is dog friendly! 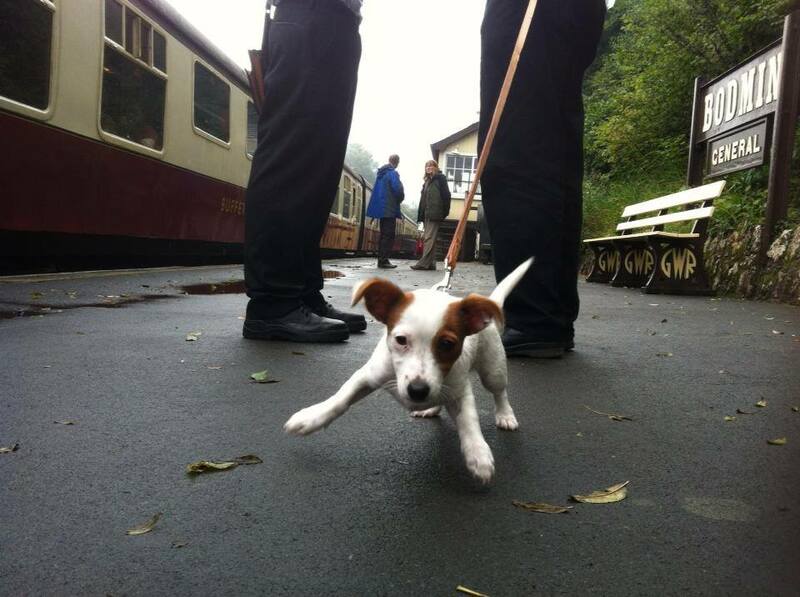 We are proud to be a dog friendly railway. When you visit, why not make a day of it with a walk to one of Bodmin’s other dog friendly visitor attractions – there are six others within walking distance of Bodmin General Station! And for cyclists, you’ll be pleased to know that we’re cycle-friendly too! You can find details further down this page. Buy a £1 ticket for Rover and he’ll be welcome to travel with you on our everyday service trains. Dog tickets entitle your pooch to paws-on-the-floor travel. We ask you to ensure that your dog does not travel on the seats, not even on a blanket, as this leaves hairs for our next customers. Dogs are welcome throughout the station and on board trains except around the on-train bar area, or where food is served. Assistance dogs only are permitted on our Dining or Cream Tea Trains, and our evening special events (Murder Mysteries, Pub Quiz train, Steam, Beer and Music trains, etc.) as food is served on these trains. We do not recommend that dogs are taken on Santa By Steam events, for the safety of both children and dogs on board. There are bowls of water on the platform at Bodmin General for dogs. While dogs are more than welcome visitors to the BWR, we do ask that you please keep them on a short lead on the platforms and on the trains, for their own safety and the safety of our other visitors. There are many beautiful walking opportunities nearby – from the Bodmin Beacon Nature Reserve (walking distance from Bodmin General Station), to the Lanhydrock Estate (alight at Bodmin Parkway), and Cardinham Woods (take the footpath from Coleslogget Halt), and not to forget the Camel Trail, 18-miles of Cornish countryside along a disused railway line between Wenfordbridge, Bodmin, Wadebridge and Padstow in the heart of Cornwall (alight at Boscarne Junction). From the station, there is a 1½-mile walk along a footpath to Cardinham Woods (which can be viewed in the distance from the station), where there are beautiful walks and nature trails. Please note that this Public Footpath runs through fields and has stiles at certain points and is not recommended for wheelchairs or push chairs and can be wet and muddy at times. Stout footwear is certainly recommended! Dog-friendly attractions on the periphery of the town are Pencarrow House and Gardens and Lanhydrock Estate (National Trust, gardens only). Bring your four-legged friend and discover the Bodmin & Wenford Railway, inside Cornwall’s most dog-friendly town. Space is limited on our trains, but we will always make an effort to get your bike on board, and if space is available then bicycles and trailers are always carried free of charge. If you are returning to the same station, why not leave your bike behind? Bodmin Parkway has steel cycle racks, Boscarne Junction has wooden posts that you can lock your bikes to, and our main station Bodmin General is manned at all times whilst trains are running. Cyclists will find a wealth of tracks and trails, all accessible from the Bodmin & Wenford Railway. Please take a look at the websites of the below for more information about facilities, trails and offerings. Skilled mountain bikers, don’t miss the Bodmin Beast and Hell’s Teeth Cycle Trails at Cardinham Woods. NB, they’re not for the faint of heart! Visit the website above for more details.